Role models have the most influence for good manners, particularly manners at the table. 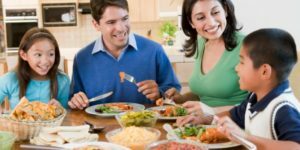 It’s tough to be a good role model with dining etiquette if your kids are regularly eating in the back of the mini-van on the way to soccer and dance lessons and hockey practice, but keep this in mind…your kids preferring eating with…watch the linked video to learn who. http://contemporaryetiquette.net/wp-content/uploads/2017/02/CEI-1.gif 0 0 Marci Lash http://contemporaryetiquette.net/wp-content/uploads/2017/02/CEI-1.gif Marci Lash2017-04-14 13:38:272017-04-14 13:38:27Who Would You Most Like to Have Dinner With?